While Chief Justice John Roberts was one of the five members of the court who voted to block the law, more than a dozen other cases are one step from the Supreme Court and could end up eroding the protections provided by Roe v. Wade. This is a law that has no basis in medicine. Abortions are safe. According to a 2012 report from the National Center for Biotechnology Information, abortion has more than a 99% safety record for every 100,000 procedures performed. Other outpatient procedures that are this safe are not legislated this way. This law could result in the entire state of Louisiana having only one health center serving women with the full range of reproductive health care. 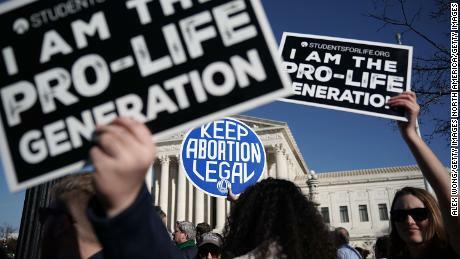 The landmark 1973 ruling, which affirms that the 14th Amendment to the Constitution protects a woman’s right to have an abortion, is under threat. And if it were overturned, 25 million women — or one in every three of reproductive age — could be living in a state without access, according to research conducted by Planned Parenthood with the organization In Our Own Voice: National Black Women’s Reproductive Justice Agenda. That appears to be President Donald Trump’s goal. I sat in the balcony of the House chamber during last week’s State of the Union address, angry and disgusted as he called for Congress to pass laws restricting safe, legal abortion and criticized state legislation that seeks to protect access to health care. He doubled down at a campaign rally Monday night where he continued lying to the American people, scaring viewers, and shaming women and their families. I won’t repeat what he said because it’s deliberately misleading and designed to be manipulative. I’m a doctor and the president of the leading provider of reproductive health care in the country: It’s my obligation to state the facts. Fact No. 1: Abortion is a safe and legal medical procedure that is also very common. Based on research from 2014, one in four American women will have one by the age of 45. It’s part of the full spectrum of reproductive health care and shouldn’t be treated any differently than other medical procedures. Fact No. 2: About 99% of abortions take place before 21 weeks. Abortions that occur late in pregnancy are often due to extreme, extenuating circumstances such as when a woman’s life is in danger, when there has been a severe fetal diagnosis, or when the pregnancy is not viable. As a doctor, I have treated women in many different circumstances. I had a patient who found out in her second trimester that the twins she was carrying were missing their diaphragms and would never develop their lungs. If she’d carried them to term, they would have suffocated upon birth. She made a deeply personal, deeply painful, and deeply difficult decision to end her pregnancy. My job as the doctor is to provide my patients with the information and services they need to make the best decisions for them and their families. Medicine is complex, and every situation is different. It’s my job to guide and support my patients in their time of need. I trust my patients; I trust women. These are extremely difficult decisions that need to be made by the patient, in consultation with her doctor. Politicians should not be making personal medical decisions for other people. Fact No. 3: In his speech, President Trump used emotionally charged and medically inaccurate language to mischaracterize bills in New York and Virginia. Let’s look at factual information about these two pieces of legislation. The bill introduced in Virginia, which has been set aside in committee, would repeal restrictions to abortion access, including a 24-hour waiting period and the requirement that three doctors sign off on late-term abortions. There are no medical reasons for these restrictions. Waiting periods have no basis in medicine; they are an attempt to judge, shame, and coerce patients. And the three-doctor sign-off would place an unfair burden on patients with potentially life-threatening emergencies. As an ER doctor, I know that when a woman’s health or life is in danger in the middle of the night, it’s hard to find three doctors to come in to see the patient, particularly in rural and underserved areas. Last month, on the 46th anniversary of Roe v. Wade, New York passed the Reproductive Health Act, which protects access to abortions at the state level even if the historic decision is overturned, and removes abortion from the criminal code. In addition, states across the country are introducing more legislation to repeal restrictions. In New Mexico, the state House of Representatives voted last Wednesday to repeal a law that made it a fourth-degree felony for a doctor to perform an abortion in the state. These efforts are an attempt to make sure women have access to the best medical care available. Unfortunately, since 2011 we have seen more than 400 restrictions placed on abortion, including making it a felony to perform an abortion if a fetal heartbeat is detected, which can be as early as six weeks and often before most women even know they’re pregnant. Despite this, support for Roe v. Wade as the law of the land has never been higher. Recent polling from PerryUndem, a public opinion research firm, shows 73% of voters said they do not want the decision overturned. Voters across the country gave elected officials a mandate in the last election to protect and expand access to reproductive health care — including the right to safe, legal abortion. Seven state legislative chambers flipped to pro-reproductive health majorities, and Kansas, Wisconsin, Michigan and Minnesota joined the 21 other states with governors who support reproductive health. Voters in red and purple states like Idaho, Nebraska and Utah voted to expand Medicaid. The American people have made it clear they want more health care, not less, and that they understand what we in medicine know to be true: that reproductive health care and women’s health care is health care. Given the threat to Roe v. Wade, states are a critical backstop, which is why reproductive health care champions are stepping up to pass state legislation that expands access to safe and legal abortions. We’re already celebrating victories, but we’re not stopping until every person in this country has access to the care they need. There was one thing that gave me hope during President Trump’s speech. I looked out at the newly elected House of Representatives — the most female, most diverse, and most strongly pro-reproductive health majority in the House in our country’s most recent history. I am honored to be in this fight with them, providing, protecting and expanding reproductive health care for people across the country, even in the face of lies and relentless attacks from the highest office of this land. Planned Parenthood was founded on the ideal that your body is your own, and without that you can never be truly free or equal. For over 100 years we have fought to uphold those values, and today is no different. The stakes are as high as ever, and the cost is women’s lives. Together with our elected officials and our 12 million supporters, we will continue to fight for our patients — in the courts, in each state, at the ballot box, and in the White House — through every means possible, so that we can continue providing health care, no matter what.